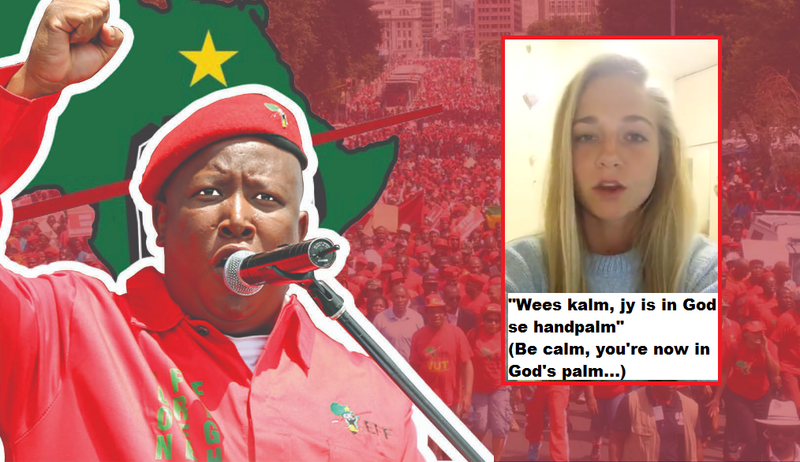 Miss René Kruger, who resides with her family in South Africa on a white-owned farm, recorded a video thanking US President Donald Trump for last week’s controversial tweet as the situation in the country worsened now that the ruling ANC (African National Congress) of South African President Ramaphosa had allowed the radical leftwing EFF of Julius Malema to co-rule the major city of Nelson Mandela Bay. Related coverage: <a href="http://thegoldwater.com/news/35267-South-Africa-Johan-Steenkamp-67-I-Have-The-Right-To-Defend-My-Property-By-Force"> South Africa - Johan Steenkamp (67): “I Have The Right To Defend My Property By Force”</a>. Meanwhile, the political mood of South Africa is turning ever more violent as the ruling ANC realizes it will need the radicals of the leftwing EFF of Mr. Julius Malema to continue their government. This rapprochement between the two parties was evident early one in the presidency of Cyril Ramaphosa, who wasted no time building bridges with the EFF. Earlier this year, in March, Mr. Ramaphosa declared that he would "love" to have EFF leader Julius Malema back in the party because "he is still ANC down deep in his heart". To give you an idea of what Mr. Malema stands for, even newspaper Business Day South Africa saw it fit to describe the EFF’s takeover of Nelson Mandela Bay in the following manner in today’s editorial: “The EFF has successfully "slit the throat" of a white mayor, which presumably plays well to its constituency”. Great. Blacks want reparations for slavery from whites yet 90% of slaves were captured and traded by other blacks. Why don't they go after themselves for some reparations and take black land? Stop and think for a second here. The ANC (African National Congress) is a Socialist/Communist Political party . It has openly stated it hates Whites and Africa needs to be Black only. But the liberal media seems to want to sweep that under the rug. Less the media forgets, in 1946 the ANC allied with the South African Communist Party. Is it because maybe it just about every Socialism and/or communism take over has historically lead to MASS Genocide? Just to poke the US Liberal in the eyes by using their own Political correctness, maybe we should allow the White Africans to enter the USA as Political refugees. It would be interesting to see how quickly they assimilate, unlike Middle East refugees. They could also claim (legally) African-American status once naturalized. That sure would gum up the EEOC. Question isn't EEF not EFF. Bonding together through race is a natural phenomenon. I don't agree with the above statement that socialism is not good. Hilter didn't succeed only because the Jews duped other whites into thinking this natural bonding was wrong and that they were being unfairly picked on. It isn't wrong, it's nature, but the International Jew wants to thwart that inclination for their own benefit and quest for power. They are against that aspect of human nature because it doesn't benefit them, except for in the case Israel, of course. It's nice to see how whites are once again wanting to throw off the shackles which have weighed us down for over a century. I do agree with the other above comment that whites in SA should be accepted into this country under asylum/refugee status. That needs to happen very soon.